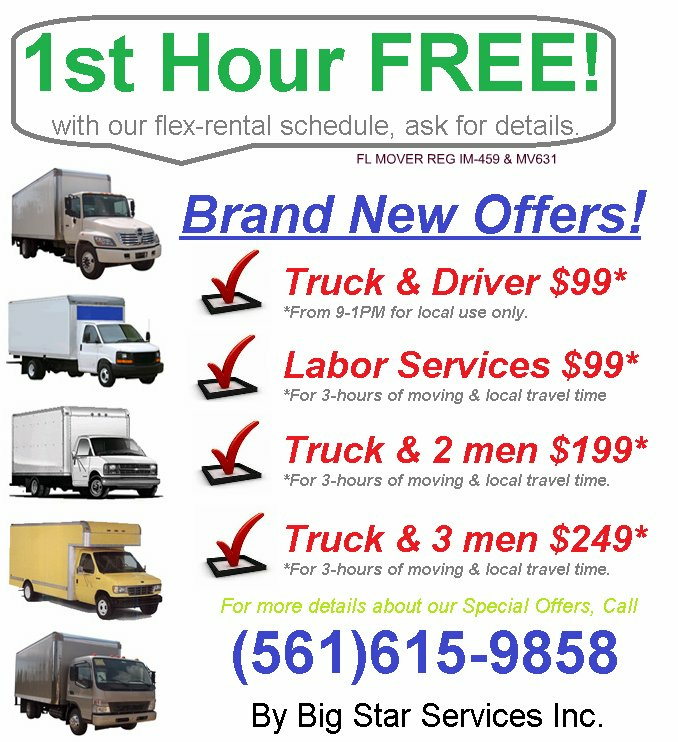 Welcome to Big Star Moving Inc. – Your #1 West Palm Beach Movers! A top rated West Palm Beach moving company with unbeatable moving rates in Palm Beach for every single budget.If you are looking for an experienced moving company in West Palm Beach and affordable movers in West Palm Beach, look no further. Big Star Moving is an experienced, professional, affordable moving company that offers efficient, reliable, on-time moving services in West Palm Beach. Whether you are a business or just need to move your family, our team of professional West Palm Beach Movers can get the job easily done. We are a local Palm Beach moving company that has had the privilege of moving thousands of people just like you.Big Star Moving has been one of the public favorite moving companies in West Palm Beach for 11 years. We will take impeccable care of your belongings and provide you with a hassle-free move. At Big Star Moving, we realize that even short distance relocation can be stressful for anyone, and that's why we strive to show our experience, professionalism and responsibility in order to provide the best moving services in West Palm Beach. Looking for moving companies in West Palm BeachIf you are planning on moving, then you have probably been looking around the Internet for movers in West Palm Beach. You have come to the right place to find the best Palm Beach moving company. Our customers have consistently rated us as the top local movers in West Palm Beach. As a top West Palm Beach mover, we strive every single day to meet every customer's moving needs.Due to our hardworking and professional team, our business has been fortunate enough to grow while providing affordable moving services in West Palm Beach, and we pride ourselves in being a family Palm Beach Moving Company who has expanded through all South Florida. Affordable West Palm Beach movers vs. Do-it-Yourself movingAlthough local moves only require transporting goods a short distance, they still consume a lot of energy, time and money: renting a moving truck; spending time packing; and time loading, transporting and unloading your shipment. Often, you will need to recruit friends and family to help, depending on the size and scope of your move. When you add all this factors, the average moving cost is only about 15-20% more expensive than moving yourself. Sometimes hiring a company is cheaper if you have to take more than one day off from work.If you are looking for an affordable moving company in West Palm Beach or reliable Palm Beach movers that offer professional moving services without compromising your budget… you have come to the right place! Big Star Moving, Inc. has built a reputation for being of great value, but under your budget movers in South Florida area over the last 11 years, providing not only cheap movers in West Palm Beach, but high quality moving services as well. The process of moving can be a complicated and stressful operation. Whether you intend to change towns or just move to a new neighborhood, choosing the right West Palm Beach moving company will determine the success of your project. Deciding which of the many available organizations to use can require a lot of time spent doing research and checking references. At Mover Nation West Palm Beach, we have already done all that for you.